Always striving to be on the cutting edge of new and exciting lighting technology, 1000Bulbs.com is pleased to announce it is now offering Kobi Electric 277-volt LED R-style lamps for use in recessed can lights, track lights and more. This new development in LED technology enables energy-efficient lighting upgrades in buildings wired for 90 to 277 input volts. Relatively new to the LED lighting market, these non-dimmable, 277-volt reflector lamps from Kobi Electric are available in R20, R30 and R40 bulb shapes and range from incandescent equivalents of 50 to 120 watts. Each lamp provides a cool white color temperature at 4100 degrees Kelvin – an optimal color temperature for lighting in commercial spaces. Kobi Electric’s 277-volt LED R-style lamps are ideal for replacing incandescent reflector lamps in structures with 90- to 277-volt light fixtures. Due to the fact that most commercial and industrial spaces are wired for voltages higher than 120, standard 120-volt LED reflector lamps are incompatible and prevent many businesses, warehouses and other commercial establishments from updating to efficient lighting alternatives that would reduce overall energy costs. 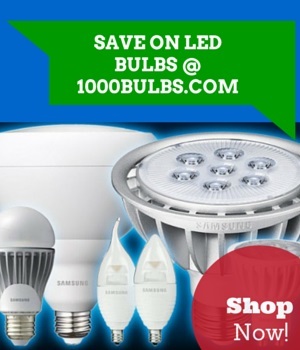 Now that these versatile, 277-volt LED lamps are available through retailers like 1000Bulbs.com, customers will be able to use one bulb for applications of varying voltage requirements and reap the benefits of upgrading outdated lighting to energy-saving LED. Capable of lasting more than 25,000 hours with very little lumen degradation, Kobi’s 277-volt LEDs will ensure the reduction of maintenance and replacement costs. Featuring a unique, built-in LED driver, they are suitable for most existing fixtures and eliminate the need for the installation of a step-down transformer by a licensed electrician. Boasting an annual energy savings of 85 percent, these high-voltage LED reflector lamps are RoHs compliant and UL listed for indoor use.